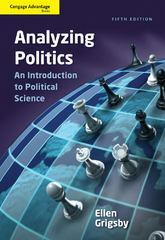 Cengage Advantage Books: Analyzing Politics 6 Edition Brief, accessible, and sophisticated, ANALYZING POLITICS, Sixth Edition, presents a clear outline of the discipline of political science and helps students understand the practical and immediate uses of applying analytical approaches to the study of politics. This text is notable for its early coverage of methods and theory and the use of a case study approach--introduced and used to acquire in-depth information about a particular subject while also pointing to its limitations. While the text covers fundamental concepts with contemporary, political examples, discussions of feminism and environmentalism offer a distinct departure from other texts and a unique opportunity to professors and students of political science. The Sixth Edition incorporates a new theme: It introduces the reader to some ways in which political science evaluates and seeks to unravel some of the complexities of 21st century politics. Because politics is rarely straightforward, students of political science need to be prepared for surprises, surprises so multilayered that they can be conceptualized as puzzles or riddles. The new edition confronts these complexities directly and brings them into every chapter of the book.